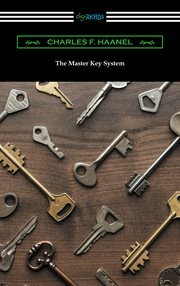 The item The master key system, Charles F. Haanel, (ebook) represents a specific, individual, material embodiment of a distinct intellectual or artistic creation found in Charlotte Mecklenburg Library. First published as a 24-week correspondence course in 1912, and then as a book in 1916, Charles F. Haanel's "The Master Key System" is a classic work of self-empowerment. A principal text of the New Thought movement, "The Master Key System" describes how one can use the law of attraction to creatively visualize a better life for oneself. As Haanel describes in his introduction to the "The Master Key System", "Nature compels us all to move through life. We could not remain stationary however much we wished. Every right-thinking person wants not merely to move through life like a sound-producing, perambulating plant, but to develop-to improve-and to continue the development mentally to the close of physical life. This development can occur only through the improvement of the quality of individual thought and the ideals, actions and conditions that arise as a consequence. Hence a study of the creative processes of thought and how to apply them is of supreme importance to each one of us. This knowledge is the means whereby the evolution of human life on earth may be hastened and uplifted in the process."